Hi Lynn, I fully support your response. Regarding your question... I think if Patti response with a denying answer to my question then that might actually be the explanation!! "A 'splitting' distal crease, of which one 'splitting' is extending across the whole width of the palm... should not be recognized as a 'Suwon crease' - because this is simply a variant of a "heart line extending all the way across the palm" (= COMPLETELY TRANSVERSING HEART LINE". Can you please confirm (or disconfirm) that? Then to further categorize this basic interpretation the researchers have described in strict guidelines how to delineate between the major creases and minor creases. (as also referred to being needed in Kimura & Schaumann's chapter on Palmar Creases and which involves your last argument with splitting heart lines) I am sure just like the Simian and Sydney lines are sub categorized into variants, so too will be the Suwon. I'm not ready to argue the characteristics of minor lines, splitting lines, fragmented head or heart lines yet. I would like first to obtain further clarification. This is all I can offer. I do believe I am absolutely on the right track. End of argument. Sorry Patti... nope, I can not confirm that you correctly described the 'Suwon crease' (in the quote above). In the 'Suwon crease' the heartline doesn't extend across the full palm [= III]. INSTEAD: It is only the combination of: the heart line + the connecting extra head line [= II+III] which creates the constelation that crosses the full palm. This implicates that a COMPLETE TRANSVERSING HEART LINE should not be recognized as a 'Suwon crease'.... because then there is only 'crease III'!!! Do you agree with this GREEN statement? PS. Regarding the formulas... of course: these are correct - as a matter fact: these are quoted from the fig.3 (C+D) pictures in the Korean article. Regarding the 'Suwon crease' in the example of the Korean researchers it is very important to notice that ... this example should NOT be described as a 'SPLITTING HEART LINE', because this is an example of 'BRANCHING HEART LINE'. Why is this not a 'SPLITTING HEART LINE'? - and the 'Suwon crease' is in this example wider as both the ulnar- and radial side of the heart line. And from my point of view, our LÓÓÓÓÓNG discussion indicates that for every potential 'Suwon crease'... one really needs to find clearly identifiable OBJECTIVE arguments. Otherwise one could easily describe any TRANSVERSAL HEART LINE as a 'Suwon crease'... but obviously: that is not what the researchers described at all!!! Because the nature of the 'Suwon crease' is much more complex: it refers to a combination of CONNECTED lines ('II+III')... plus the presence of a normal head line. Ok yes. I agree that (in the light of this research) (in theory) there is a difference between 1) a splitting head line where one of the forks completely crosses the palm and 2) a Suwon line. The difficulty I have is in distinguishing between 1) and 2) on handprints/pictures. On the researchers' example we can clearly see that the suwon is an extra line joining the heartline. We can see it because it is wider. However I didn't notice width being part of the criteria in the researchers' description of a Suwon. Do we know for sure that the width of the extra line attached to heartline in a suwon crease should be wider than the main heartline? In Patti's photo example where you put circles round the overlaps, I can't be sure whether it is a splitting heartline or a suwon line. As Patti previously said - I think we need more examples from the researchers! Martijn wrote: "A 'splitting' distal crease, of which one 'splitting' is extending across the whole width of the palm... should not be recognized as a 'Suwon crease' - because this is simply a variant of a "heart line extending all the way across the palm" (= COMPLETELY TRANSVERSING HEART LINE". I think it might be categorized as a Suwon variant, but in the coming months as other researchers pick up this method we'll know - won't we? haha --- the Suwon crease as you simply mentioned yourself in earlier posts is a heart line that extends all the way across the palm with a separate head line. That's all. After that we have to discuss the quality of this long heart line and choose what are minor lines and what are major. Kumura & Schaumann point out the confusion in the subcategories or variants without the various researchers giving details as to what defines them. They further point out a need for consistent definitions of the minor lines. This is exactly what the Korean's are doing. They are carrying out the wishful thinking of Kimura and Schaumann in designing *objective* guidelines for the relationship of the major creases with each other and with the minor lines. They have also provided guidelines for the description of the minor lines. 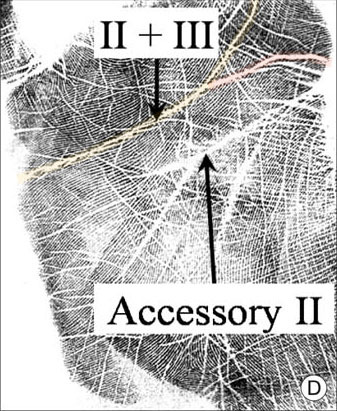 In their paper they also present a method to map and measure the hand with coordinates. Through this process they can obtain what they call T-DoT (total degree of transversality of the creases on the palm). In the process of their observations they came across the extra long heart line (one that crosses the width of the palm) with a separate head line and named it as it didn't already have it's own name. That's it. You are both trying to make more out of the Suwon crease than the Korean scientists have done. It would be more appropriate if we worked with the subject of the Sydney line and it's variants. The rules for it should apply to the Suwon. The comparison of width to the Accessory II or lower headline was only presented by Martijn and not the researchers. This confused us both in the beginning of this discussion. I never described that a change in 'width' is REQUIREMENT... but did you notice the role of the change in 'width' in the example of the Korean researchers? That Korean example perfectly illustrates how 'width'... CAN become one of the clues that there is really a SECOND LINE (extra head line) involved. (In all three 'Suwon crease' examples that I present earlier in this discussion... I do observe a change in 'width'; but all three examples ... also display multiple other clues, varying from: change in structure, 'angle', lines crossing the heart line... and maybe most important: the ABSENCE of a 'smooth' continuation of the radial part of the heart line). OK Patti, thanks but sorry... this is another area of confusion for me in this discussion! In the research paper, they give the criteria for distinguishing between major & minor lines. You've mentioned about width of minor lines a few times & I don't understand the relevance of that when talking about Suwon which is a variation of a Major line. We've always said a sydney line is a headline that traverses the whole palm. But in the light of this research, it is slightly different to our previous perceptions. These researchers are telling us that a Sydney line is a headline with an extra bit of heartline attached to it, thus forming a line that crosses the full width of the palm. It is the extra attached bit of heartline that creates the length of the line. Similarly a Suwon is a heartline that has an extra bit of headline attached to it. It is the extra bit of headline that makes this line cross the full width of the palm. So it isn't the same as a long completely transverse heartline. I think it might be categorized as a Suwon variant, but in the coming months as other researchers pick up this method we'll know - won't we? Okay Patti, thanks for responding to my question! 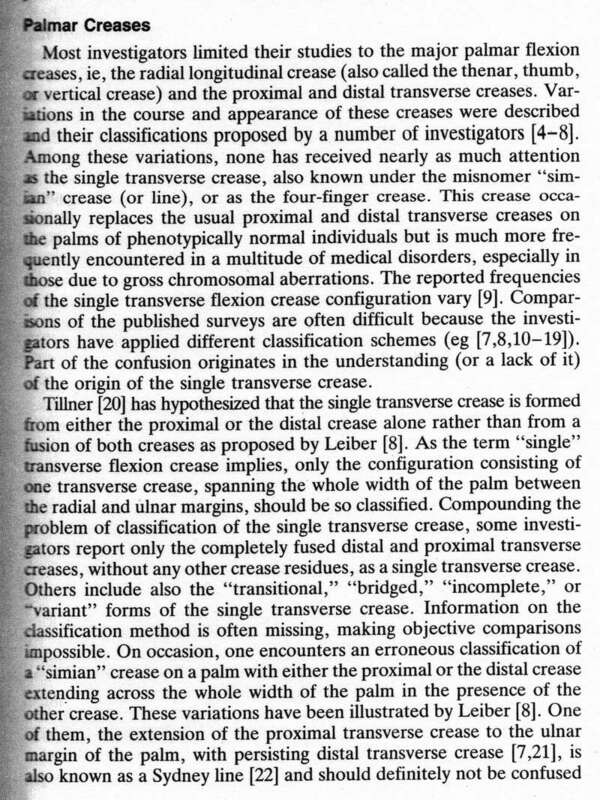 Therefore I can only conclude that you do not discriminate a 'Suwon crease' from a... "distal crease extending across the whole width of the palm"! Sorry... I have shared all my arguments, and I have nothing else to add. Thanks for posting the pages from the book Patti, but it doesn't alter the way I understand it! Hence, from my POV it's not the end of the argument! (or discussion). For one thing, Leiber's illustrations show a long heartline that completely crosses the palm, and a long headline that completely crosses the palm. But no pic shows an example of a Suwon line. But what I've highlighted in green is not exactly right, as you already said underneath it. Notice underneath you have the 3 components for Suwon - III + II plus Accessory II. They are referring to a heartline, with an extra bit of headline attached to it, plus accessory headline. Whereas your sentence in green only has 2 components - "very long heart line that extends across the palm" plus accessory headline. Yes, the Suwon crease is a long heart line that extends the width of the palm with the accessory head line. The Suwon crease is defined by not crossing the width of the palm by means of minor lines. Now it's important for us to understand what in the scientific community details a minor crease. (sigh!) What we need to be working on is what is II + III. I keep saying we need to discuss the Sydney as it is II + III as well. The same qualifications will work for it. Again, I didn't view it like that! In my understanding, major & minor lines are two different types of line on the hand (then there are also subsidiary lines). I saw the researchers trying to define how to distinguish Major lines from Minor lines. (but nothing about major lines being elongated by minor lines). They say the Major lines are radial longitudinal crease, proximal transverse crease & distal transverse crease. "The minor palm creases were not analysed and just observed". So they are only analysing the Major lines. I agree the researchers have left too much room for speculation. Hence Martijn made his own observations to distinguish Suwon from forked heartline. I still think we need more examples from the researchers before we can be sure exactly how to notice a Suwon line. We have all been posting so fast, I am going to take some time now to review the discussion as I think I've missed some posts. Lynn wrote: They are referring to a heartline, with an extra bit of headline attached to it, plus accessory headline. The idea that there's an "extra bit of head line attached to it" isn't necessary (in my opinion) That goes back to the pages from the book. Is is one line or is it two merging - Kimura and Schaumann bring that up. Note that in their example of a Sydney line there's a fork or a deep incoming branch meeting - this aspect is not clarified in the research paper. That particular aspect is in question. That again is why once again I say we need to be displaying and discussing the Sydney. I went through my books in search of absolute descriptions for the Simian and the Sydney - that's how I came across the quote in purple. 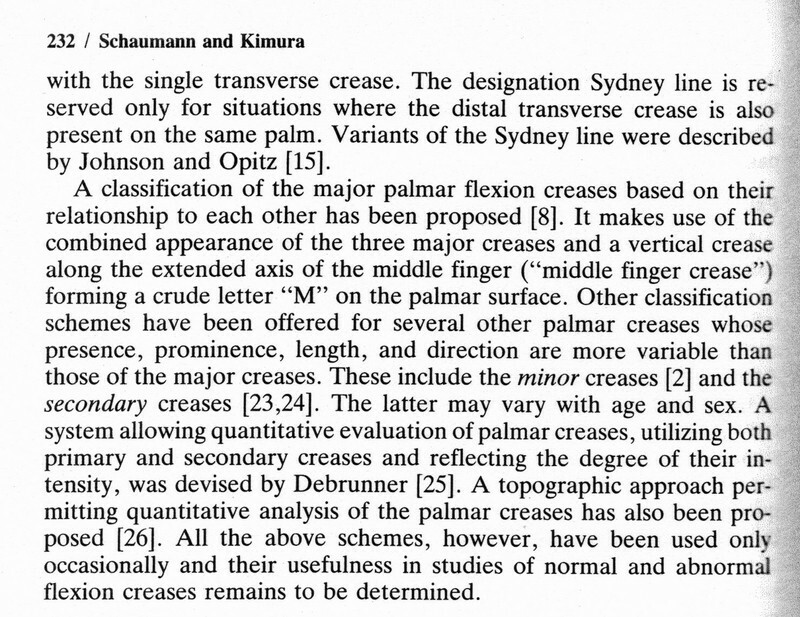 The researcher's paper is not "about" the Suwon crease it's about measuring and mapping the major creases of the palm. They tell us how to tell the major creases from the minor creases. I don't have time to search for it now, but it's pretty clear they want us to know the Suwon is a major crease. They tell us in two places on the report what details a minor crease. They give examples of different endings to heart lines that have minor creases or different kinds of endings - that are not Suwon related. But that is the definition of it! II + III with accessory II (head + heart with accessory head) so there must be that 'extra bit of headline' attached to heartline for it to be classed as a Suwon. I see your point about discussing the nature of the Sydney line. The researchers example of the Suwon is on a curved heartline. Could there be a Suwon which was a short straight heartline with extra headline added (which in the past we would have called a long straight heartline). Enjoy your evening Patti, your head must already be buzzing with palmar lines before you even start! "In all three 'Suwon crease' examples that I present earlier in this discussion... I do observe a change in 'width'; but all three examples ... also display multiple other clues, varying from: change in structure, 'angle', lines crossing the heart line... and maybe most important: the ABSENCE of a 'smooth' continuation of the radial part of the heart line." While I made this comment after I described 3 specified characteristics of the 'Suwon crease'-example of the researchers!! I made that comment to help people how to recognize a 'Suwon crease' ... because obviously the formula presented by the researchers (Suwon crease = "II+II plus accessory II"), does not describe how to discriminate a 'Suwon crease' from 'complete transversal heart line variants'. Now... ... for me it is quite disappointing to notice that - after my continued efforts for providing feedback on the many the many examples, questions & observations shared in this discussion - my final substantiated attempt to describe the 'Suwon crease' with more details than a FORUMULA only... was answered by Patti as: 'speculation' only. Hope you're not bald yet! Could you show me in the article where the researchers even mention the list of qualifications you just presented? Hi Martijn. Yes I do notice those 3 things in the given example. However, I am not sure why you took the passion line into consideration. Why is that line relevant? Patti has the 'opinion' that the 'Suwon crease' is basically not much more than a very long heart line... which extends to the thumb side of the palm. But such heart line variants are seen about 10-times more often than the prevalence a Suwon crease (Korean study reported a prevalence of 0.5%). Patti wrote: The researcher's paper is not "about" the Suwon crease it's about measuring and mapping the major creases of the palm. They tell us how to tell the major creases from the minor creases. I don't have time to search for it now, but it's pretty clear they want us to know the Suwon is a major crease. They tell us in two places on the report what details a minor crease. They give examples of different endings to heart lines that have minor creases or different kinds of endings - that are not Suwon related. Yes I know what the paper's about. I just didn't understand why you were referring to minor lines in discussing Suwon crease, which is a major line. Sorry I can't find where it says anything about different endings to heartlines that have minor creases.